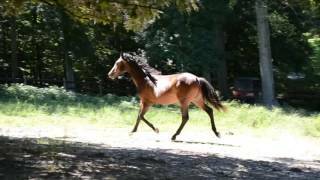 Capulet is a 2015 Bay Hanoverian Filly by the Hanoverian stallion Coeur d Amour and out of Gi Gi Giselle (Grandom). Capulet is an uphill mover, with good conformation, and a very sweet personality. She is expected to mature to 16 hands. Would be best suited for hunters or dressage. Amateur friendly. Stands for vet/farrier. Up to date on shots, coggins, worming, farrier, etc. Registered AHS, and USEF lifetime number.